If there are three things you can count on Italians to be passionate about it would be: their food, their family and their soccer (calcio). 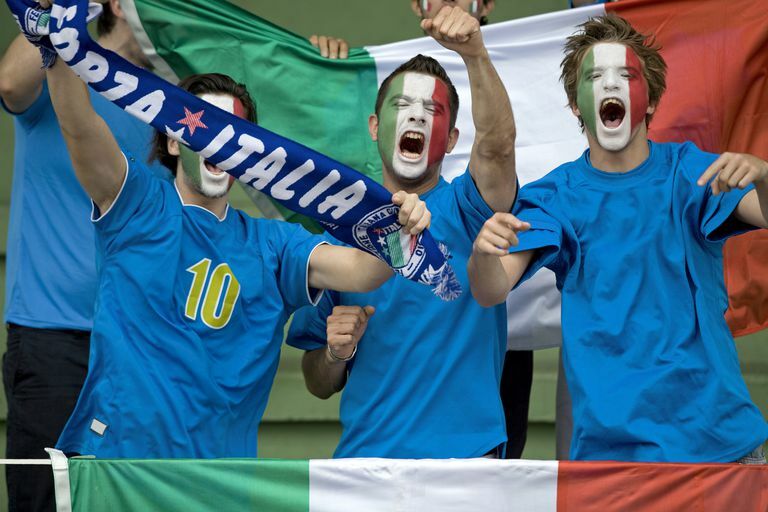 The pride of Italian’s for their favorite team knows no bounds. You can find fans (tifosi) fearlessly cheering in all kinds of weather, against all kinds of rivals, and with a dedication that endures generations. Part of the fun of learning about soccer in Italy is also learning about the nicknames of the teams. But first, it's important to understand how soccer works in Italy. Soccer is broken down into various clubs, or “serie.” The best is “Serie A” followed by “Serie B” and “Serie C” etc. Teams in each “serie” compete against each other. The best team in “Serie A” is regarded as the best team in italy. The competition in Serie A is fierce and if a team doesn’t win or do well in a season, they can be demoted to a lower “serie” much to the shame and disappointment of their adoring fans. Now that you understand the basics of how Italian teams are ranked, it is easier to understand their nicknames. Some of these nicknames seem random but they all have a story. For example, one of my favorites is the Mussi Volanti (Flying Donkeys—Chievo). They were given this nickname by their rival team, Verona, because the odds of Chievo entering the Serie A league was so slim (like the English expression to express unlikely odds, “When pigs fly!” In Italian, it’s “When donkey’s fly!”). I Diavoli (The Devils—(Milan), are called as such because of their red and black jerseys. I Felsinei (Bologna—is based on the ancient city name, Felsina), and I Lagunari (Venezia— comes from the Stadio Pierluigi Penzo that sits adjacent to the lagoon). Many teams, in fact, have multiple nicknames. For instance, the illustrious Juventus team (a longstanding member and winner of Serie A) is also known as La Vecchia Signora (The Old Lady), La Fidanzata d'Italia (The Girlfriend of Italy), Le Zebre (The Zebras), and [La] Signora Omicidi ([The] Lady Killer). The Old lady is a joke because Juventus means young, and lady was added by rivals who were essentially poking fun of the team. It got it’s “girlfriend of Italy” nickname due to a large amount of southern Italians who, lacking their own Serie A team, became attached to Juventus, the third oldest (and most winning) team in Italy. Besides these less obvious nicknames, one other colorful tradition, is to refer to the teams by the color of their soccer jerseys (le maglie calcio). The terms are frequently seen in print (Palermo, 100 Anni di Rosanero), as part of fan club names (Linea GialloRossa), and in official publications. Even the Italian national soccer team is known as Gli Azzurri because of their blue jerseys.